Historic Yellow Springs will be hosting its 36th Annual Yellow Springs Art Show and Sale from April 25th to May 10th. The show features over 170 juried artists exhibiting in the area's finest show and sale of paintings, drawings, graphics and sculpture. A gallery exhibit in the Lincoln Building featuring original scenes of Historic Yellow Springs. 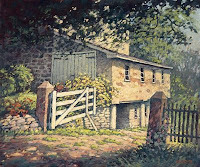 See a special selection of new paintings of our enchanting village and purchase one for your home. Bring your friends, colleagues or significant other to this free wine and cheese reception to enjoy the show and friendly conversation. Follow the clues, find the art, get a prize! This game encourages observation and interest in art. The event will take place at 1685 Art School Road, Chester Springs, PA 19425, and will be open from 11am-5pm daily and until 8pm on Fridays. This is a FREE event. For more information, see the art shows website at http://www.yellowsprings.org/artshow.html. I have attached an image of Open Gate by J. Scott Wolf, our 2009 Art Show Poster Artist.